I can't imagine that these wagon wheels have always been here so it must be that this home owner had a visual concept that these unusable relics would look great in his front yard. The interesting result of the wheel's location is that, until I took a close look at my picture on the computer, I didn't even notice the telephone support cables but only the wheels. I wonder if that was his intention? This house in Downey always fascinates me when I pass it. The front door and therefore its address is on a cul-de-sac street but its garage is on another through street. I guess visitors are told to come by one road while the owners come by another. Last night while I was in the process of writing my post, the power went out. So, I planned to get up early and finish it first thing in the morning. Unfortunately, the power was still out in the morning...and the afternoon...and a good part of the evening. Instead of doing my post first thing in the morning, I made a trip to the store as did a friend and after 12 bags of ice we finally had enough. 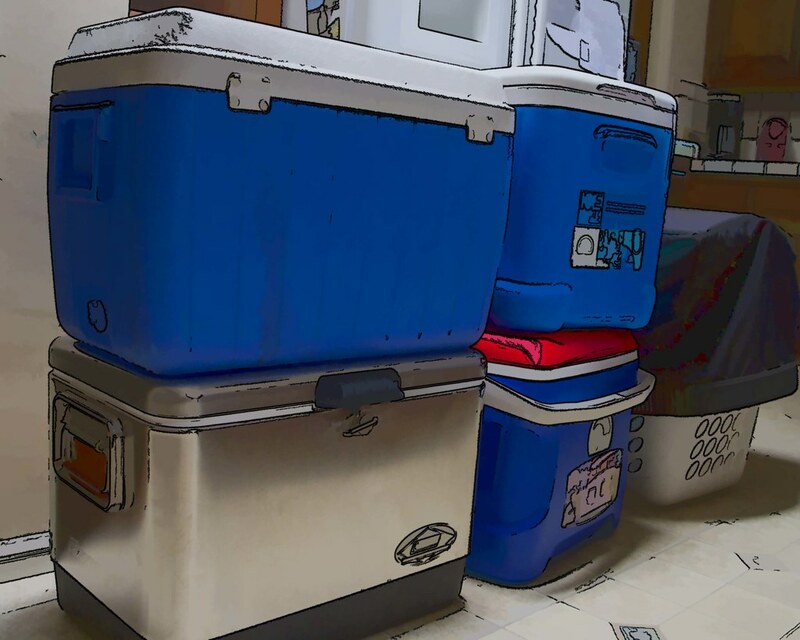 As you can see, it took all of my coolers and then some to empty the refrigerator to try to keep things cold. Were you caught in the "unplanned outage"? According to the follow-up email I received from SCE (Southern California Edison), the outage affected approximately 3,823 customers. Riverbeds. Graffiti. Train tracks. Puddles. Reflections.Repeating patterns. 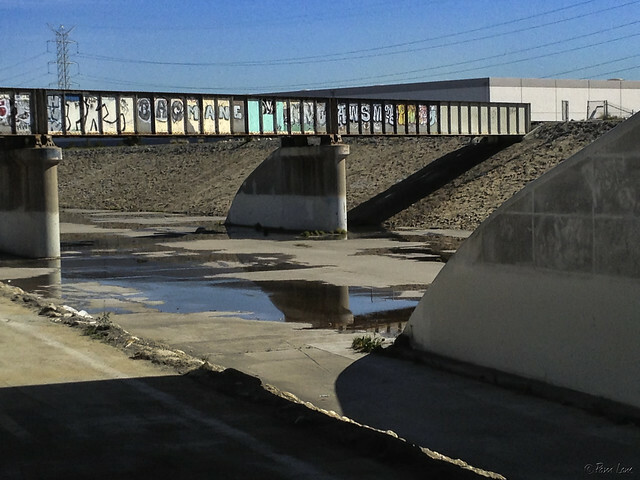 Sometimes I just get lucky and find all sorts of things that I like to photograph, all in the same place (the Rio Hondo riverbed), at the same time. 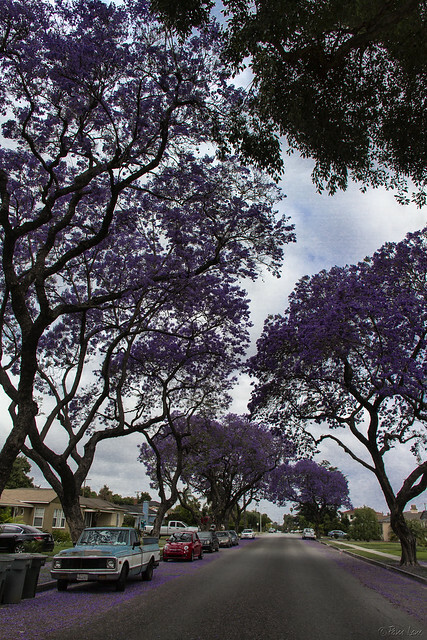 The Jacaranda trees are in bloom again. I love driving down the streets that are lined with billowing purple clouds of flowers. 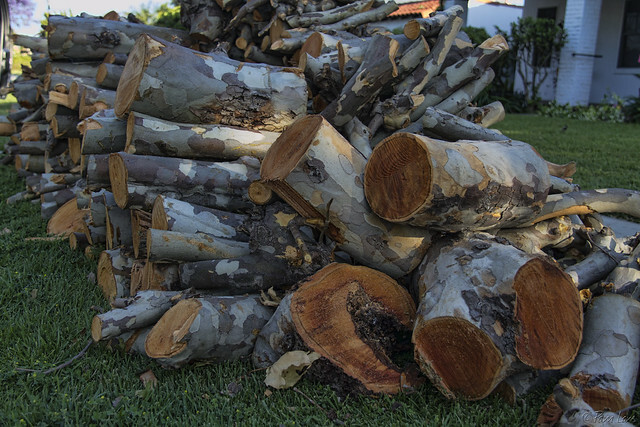 I might feel differently if I had one of these trees in my yard. 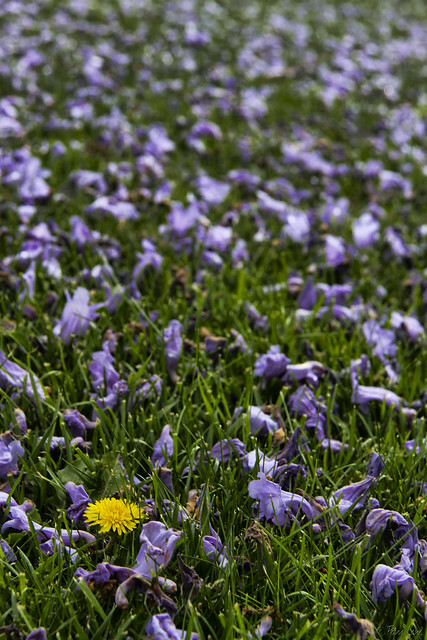 The flowers that cover the streets and lawns are beautiful. But the seed pods that will follow in a few weeks are, I suspect, a nuisance. 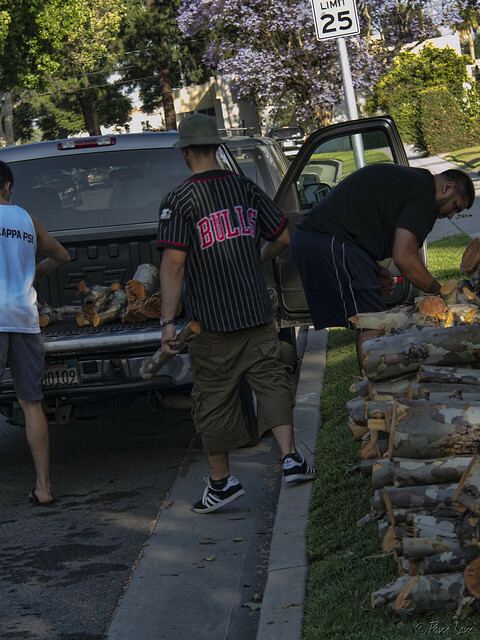 Went into northeast Downey tonight and found these children at work in this front yard. They look very industrious at first glance, but I noticed they didn't get much done. 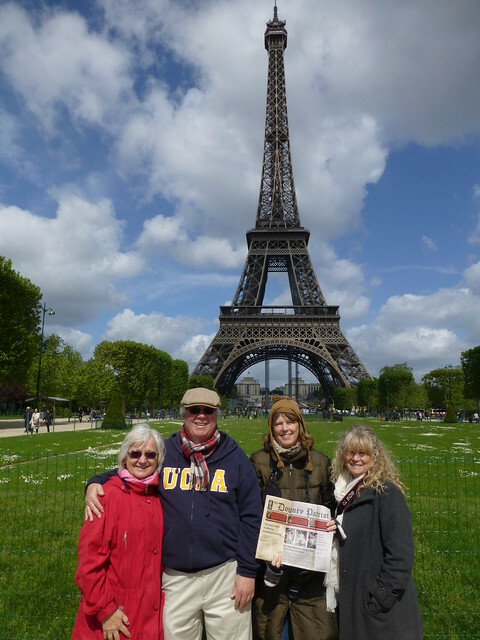 With Memorial Day less than a week away, I seemed appropriate to use a couple of my pictures from France. 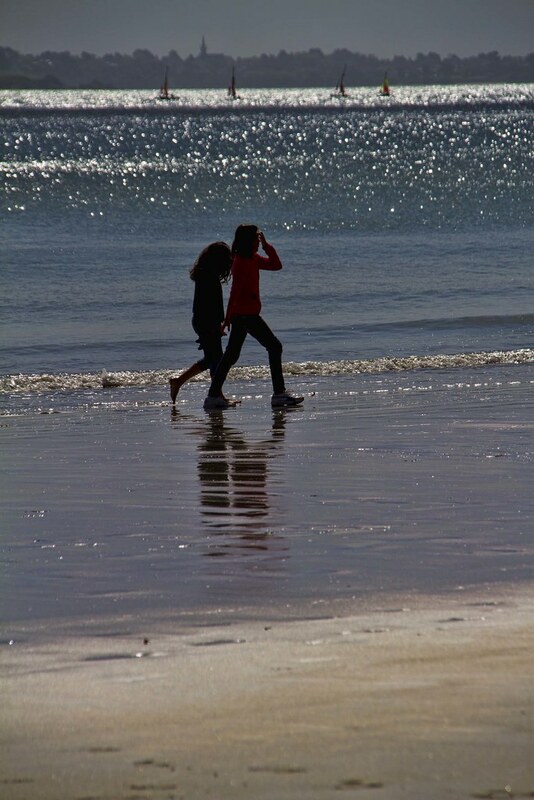 While in Normandy, we visited Omaha Beach - one of the D-Day landing sights. 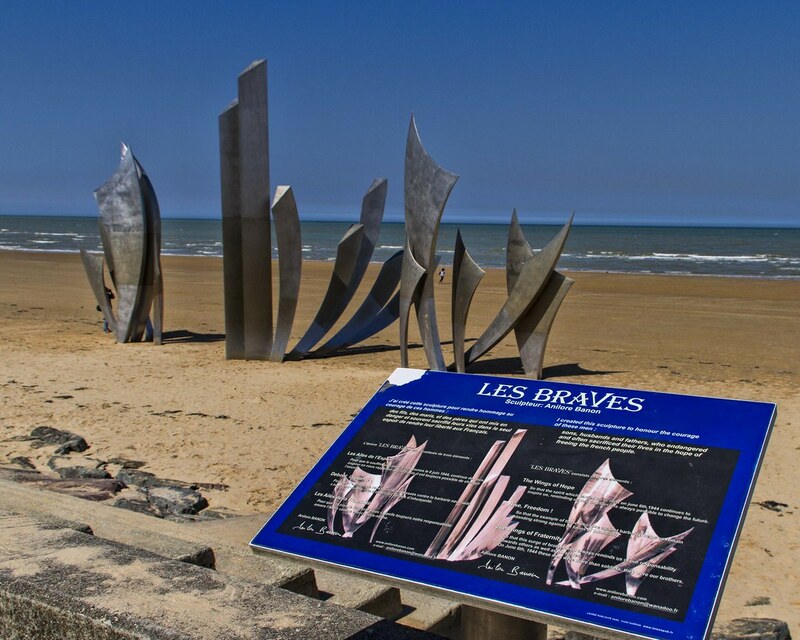 On the now peaceful beach stands a sculpture by Anilore Banon, dedicated to honor the courage of the sons, husbands, and fathers who endangered and sacrificed their lives in hopes of freeing the French people. 1. 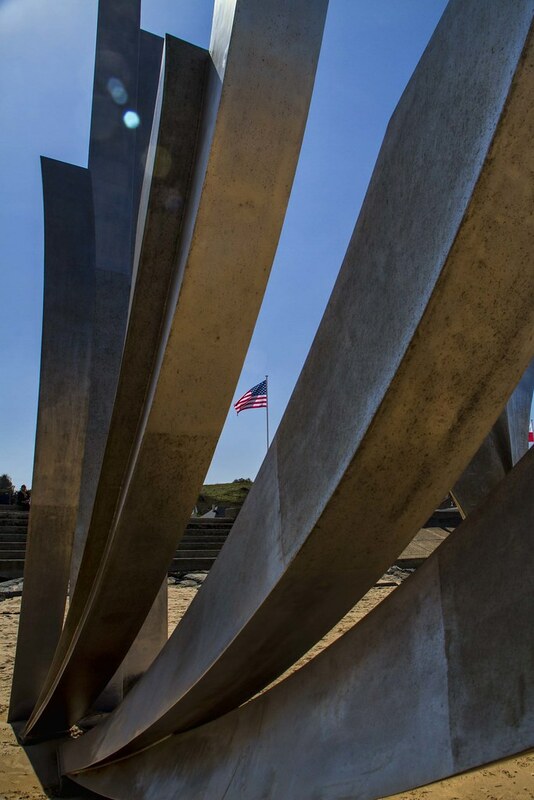 The Wings of Hope - so that the spirit which carried these men on 6th June 1944, continues to inspire us, reminding us that together it is always possible to change the future. 2. Rise of Freedom - So that the example of those who rose up against barbarity, helps us remain standing strong against all forms of inhumanity. 3. The Wings of Fraternity - So that the surge of brotherhood always reminds of our responsibility towards others as well as ourselves. 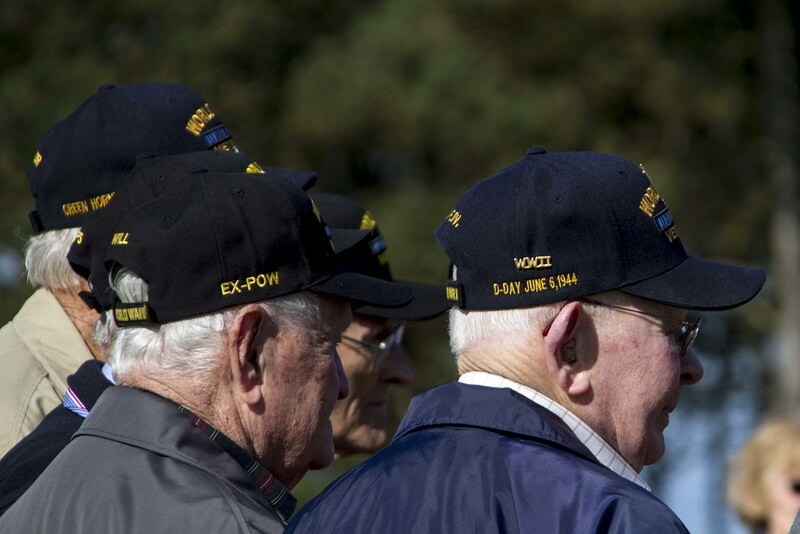 On 6th June 1944, these men were more than soldiers, they were our brothers. 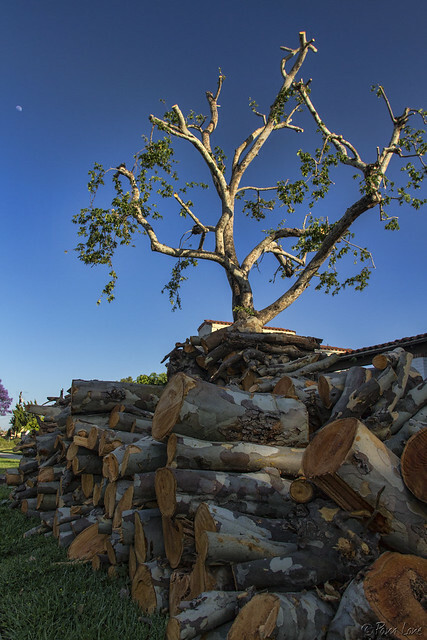 Did you know that almost 100 acres of Downey are devoted to 11 area parks? At Downey Daily, we tend to focus on Furman Park (because it's close) and Wilderness Park (because it's pretty). Today, I decided to visit the rest of the parks over the course of the next few weeks. This is Dennis the Menace Park, hidden in a cul-de-sac in north Downey. Dennis the Menace is a comic strip character originally from the 1950s, "a precocious but lovable, freckle-faced five-and-a-half-year-old boy with a famous blond cowlick and a penchant for mischief." (Wikipedia) The park is the perfect place for present-day menaces to have some fun. For a medium-sized park, it has a very large kid's playground, with lots of slides, swings, and things to be climbed. 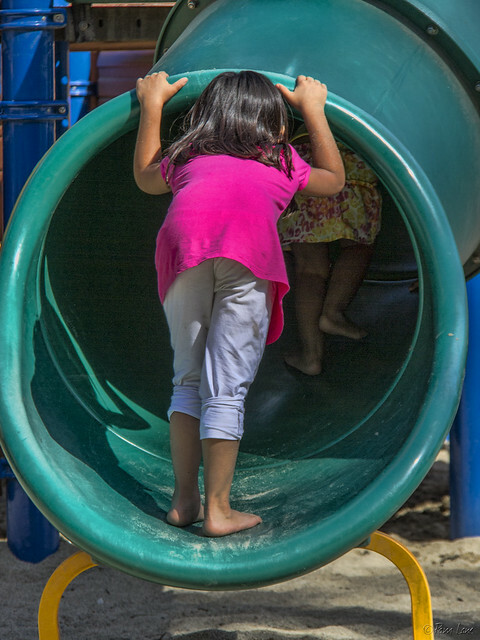 What kid can resist the temptation to climb the wrong way up a slide? These two young girls in the main picture couldn't! 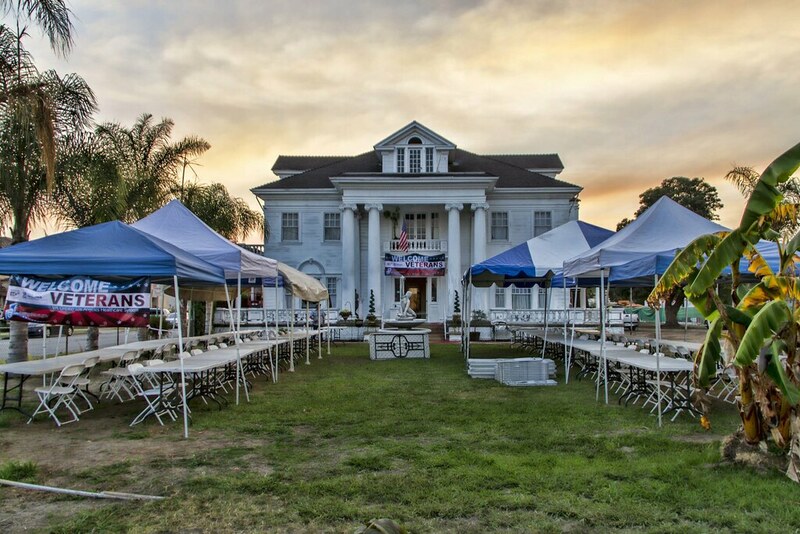 Being gone a couple of weeks on vacation meant missing some annual Downey events that we love. 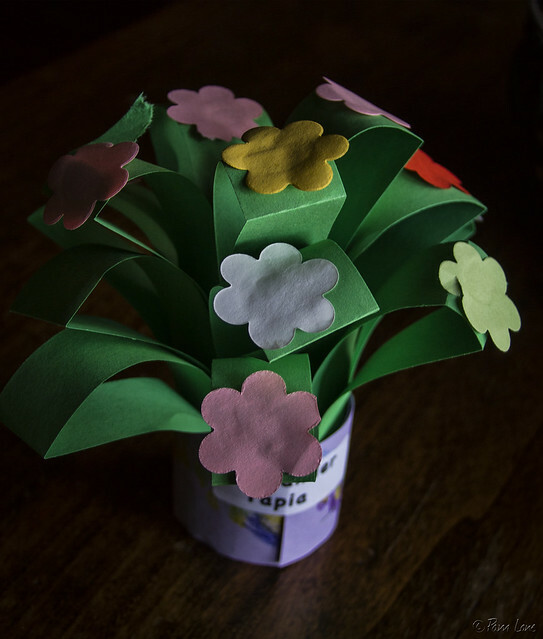 We missed the Downey Street Fair with its classic car show, Kid's Day at Furman Park, and May Day, when the kids from the local Rio Hondo Elementary School deliver bouquets to all the homes in the neighborhood. But even though we missed the kids actually delivering the bouquets, we were very pleased to see that the flowers lasted until we arrived home! Today's color is a car. But not just any car, a 1972 Ford Pinto. I'm not sure what color this is, maybe a mustard brown. Boy, they don't make them like this anymore. I see this car often on my bike trips but I haven't seen another Pinto in years. I stopped by to talk to the owner, Diane. She informed me that she is the original owner and that every thing on the vehicle is stock equipment. She also said that she is finally thinking of selling, after 41 years. What was your first car? Mine was a 1963 green Mercury Comet with three on the column and an in-line six. 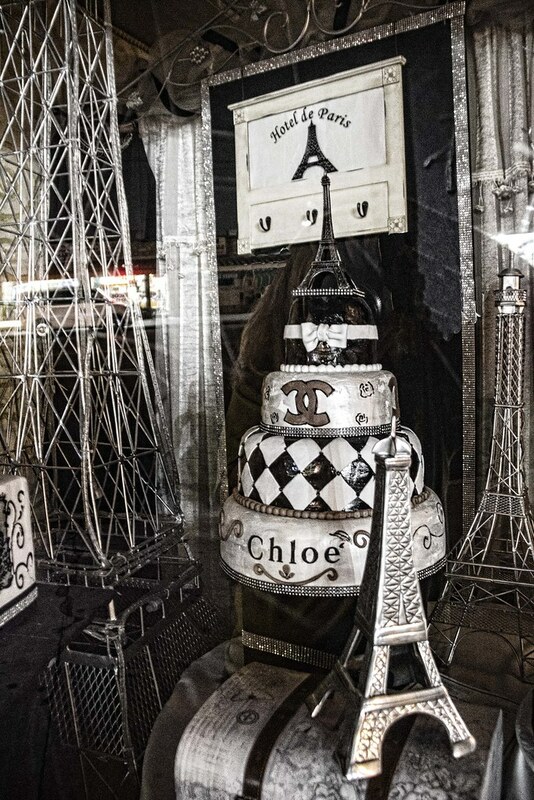 Keeping in this week's theme, I submit the following picture of a candy store in Dinan, France. Sorry, I'm still catching up with having not been here for two weeks. Have you ever looked at your email after two weeks of neglect? My yard is the same way. Avocado leaves so thick I'll have to put some in next week's bin. Anyway, these lollipops were an instant eye-catcher as we were walking down the street. You don't even see any sticks, only the colorful wrappers. We even bought some. We do have candy stores in Downey, such as See's candy on Paramount Blvd. and also in Stonewood Center. Sweet Fantasy Candy Shop is also in Stonewood Center. I love spring! This photo is from a few weeks ago, but it gives the sense of what I love about spring....it's color and beautiful blossoms. Vacation is over and it's good to be home. The only problem is that I have tons more pictures of France and no backlog of Downey pictures except this one. 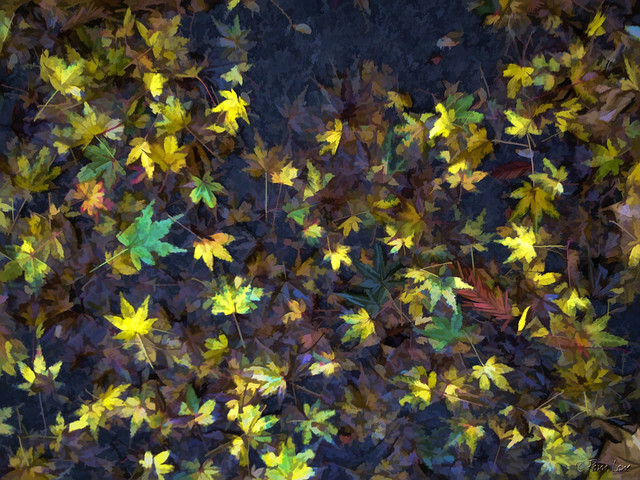 So I hope you enjoy this colorful pile of leaves after a recent rain in Downey. It seems like everywhere we go in Paris, people are cuddling. Sometimes they are snuggling on the conveniently placed park benches, sometimes along the steps of the Seine. 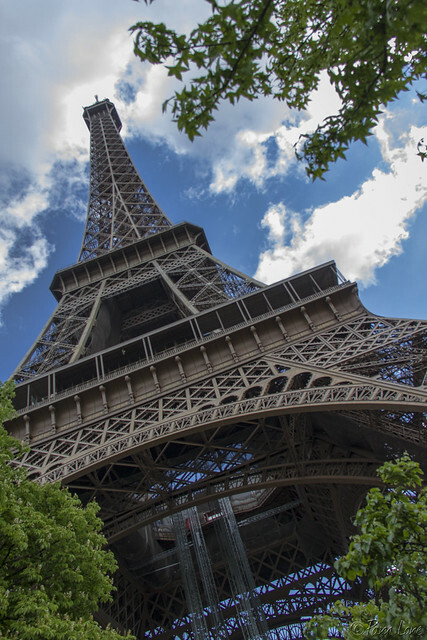 It's easy to do in a city as picturesque and romantic as Paris. No rules here on PDA's. Pam wrote yesterday about the "locks of love". 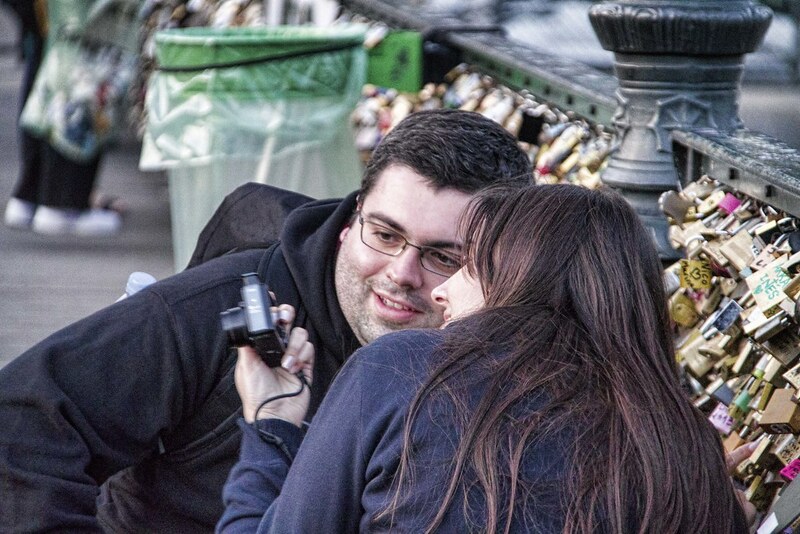 This couple was so cute, taking their picture with the lock they added to this bridge. 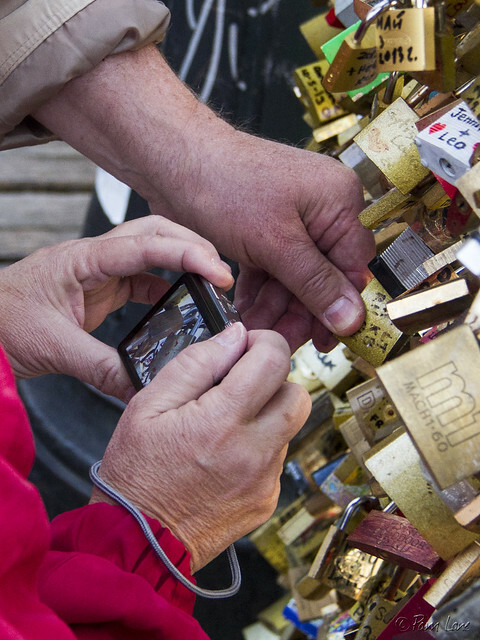 Two years ago, we showed you the "locks of love" in Paris and St. Petersburg. A couple attaches a padlock to a bridge and then throws the key into the river to symbolize the permanence of their love. So what does it say about their love when they use a combination lock? In the two years since, the custom has grown in popularity. 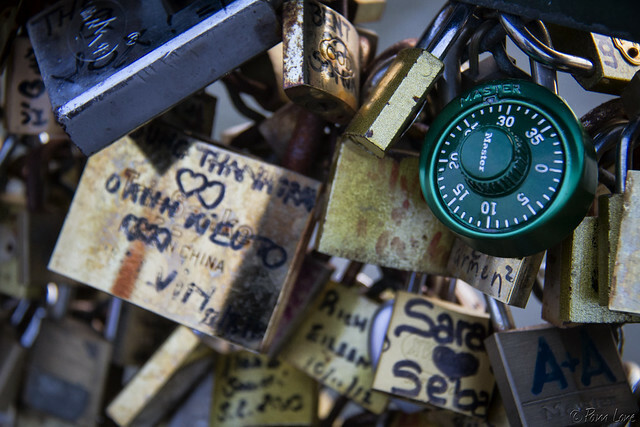 You can now buy your lock from street vendors right there on the most popular bridges. 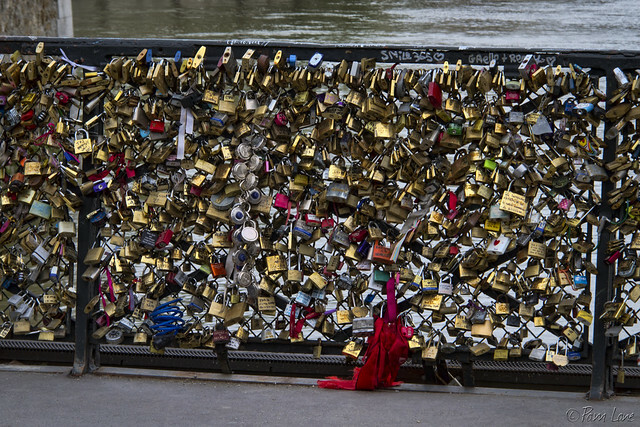 There are so many locks that it is hard to find a bare spot to attach your lock, and many locks are now attached to other locks instead of the bridge itself. And now two of those locks belong to Downey residents. Our third major city to stay in this vacation was Brugge, Belgium. Here Bonnie and Joan are checking in with our hostess, Mirielle, at the Hotel Van Eyck. She told us her story of how she came to own the hotel. She came here some years ago and stayed in the same spare room Bonnie and I were going to stay in and while here she knew her life was going to change. She went back home, quit her job as a school teacher and several weeks later came back to Brugge and bought this hotel. She has never regretted her move. This is the staircase up to our room. 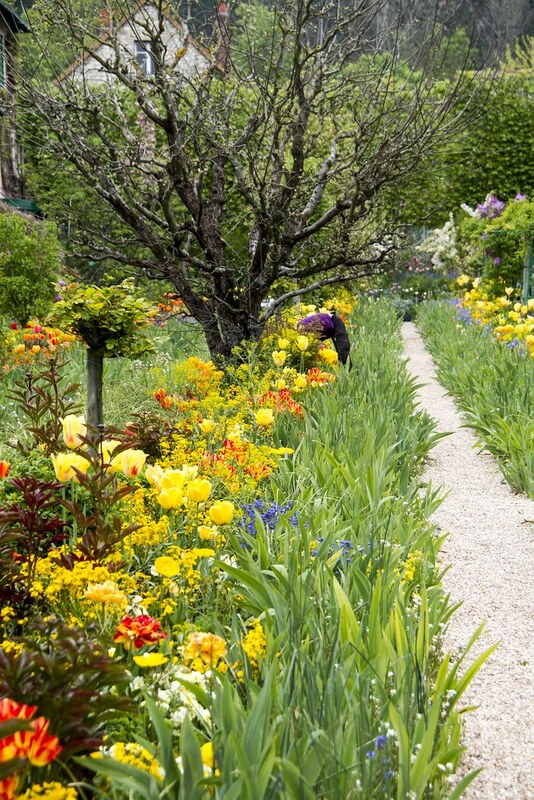 The gardens at Giverny were amazing. 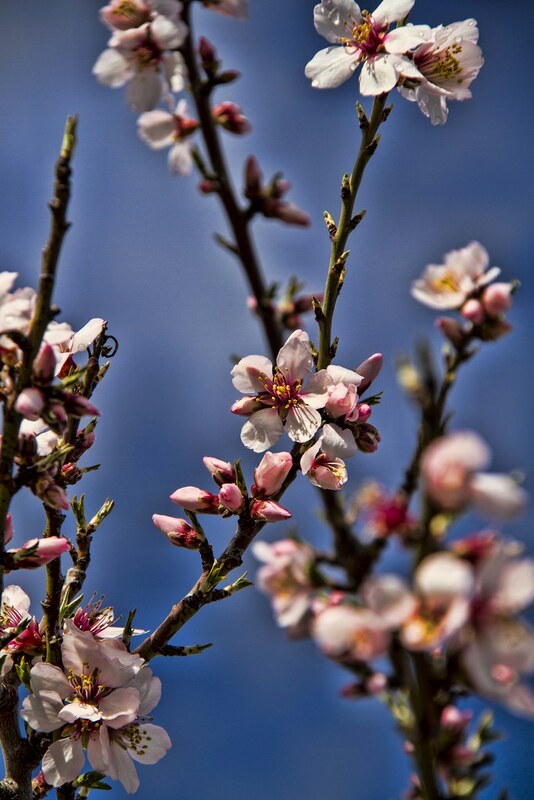 It gave me a new appreciation of the beauty and the diversity of flowers. It's hard not to spend the entire day trying to absorb it all in. In California, students learn about the early Spanish missions. They take field trips and write reports. 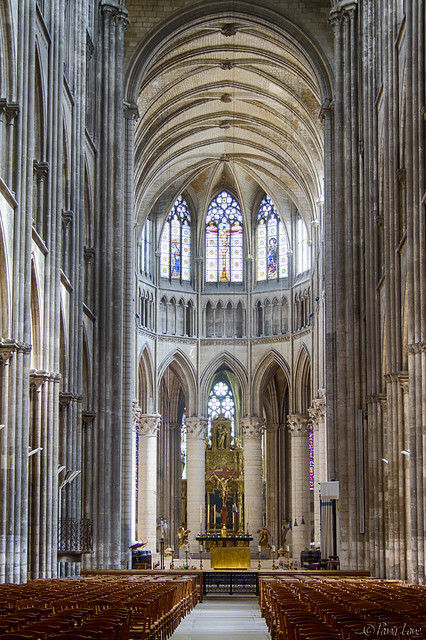 In Rouen, students do the same type of thing—except they write about and visit the magnificent Cathédrale Notre-Dame in Rouen. 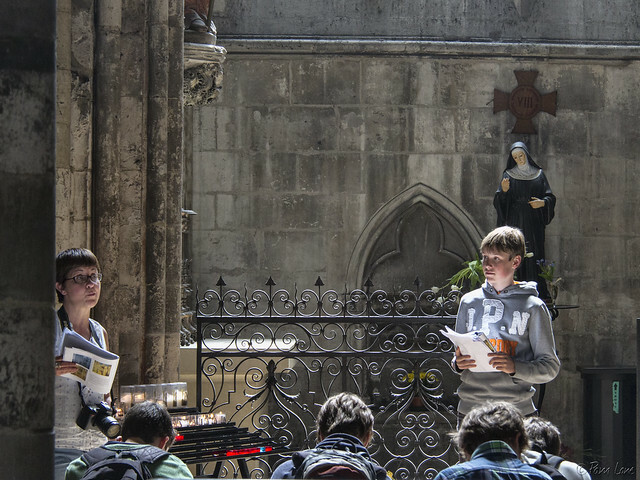 There were lots of school-aged children in Rouen today, but the most fun to watch were those that were presenting their oral reports on the cathedral. There's so much to see and report on—I wonder how they divide up this awesome task. There's the history, the architecture, the organist (who we got to meet and talk with yesterday) and his music—the list goes on and on! Construction began on the current cathedral in the 12th century. Richard the Lionhearted's heart is buried here. Claude Monet painted a series of paintings of the cathedral—the same scenes at different times of the day and in different weather conditions. The cathedral was nearly destroyed in the bombing that led up to the D-Day invasion in 1944 and has been undergoing restoration ever since. There's something about the light. Painters, especially in the 19th century, have flocked to Honfleur because of the irresistible quality of the light reflected from the Seine estuary. 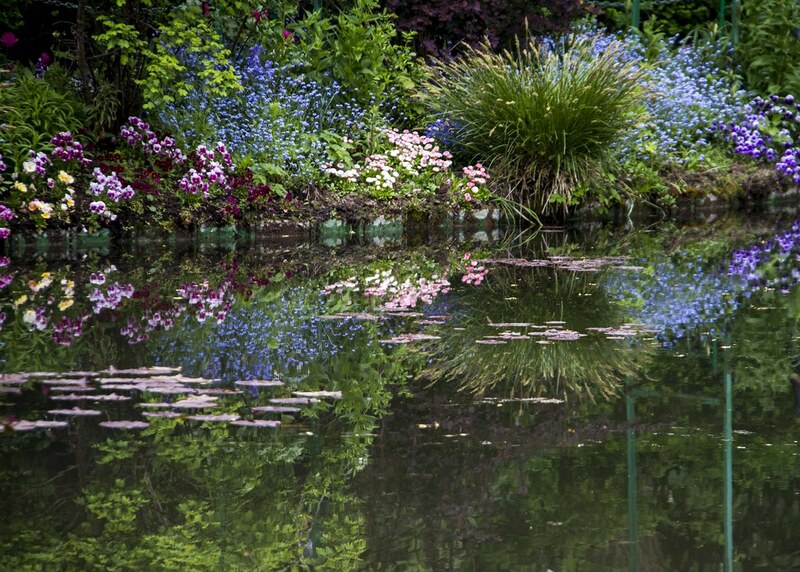 This light has inspired painters such as Courbet, Monet, and Boudin. 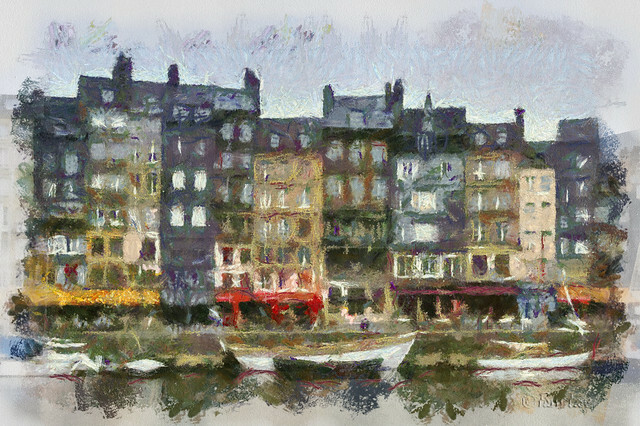 So in honor of Monet, here is the Honfleur port, Monet-style. However, I think these artists had an advantage. Unlike us, they could wait for the light. Judging by the postcards in town, I'd guess that the weather in this area is often rainy and overcast (and cold!) like today. 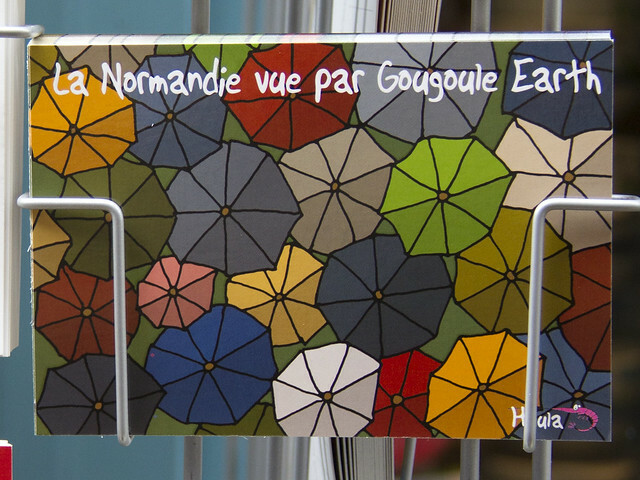 This postcard says "Normandy seen by Google Earth." In addition to its artistic appeal, Honfleur is the home of the Sainte-Catherine church, which is the largest church made out of wood in France. We walked by this beautiful old church just as mass was ending. 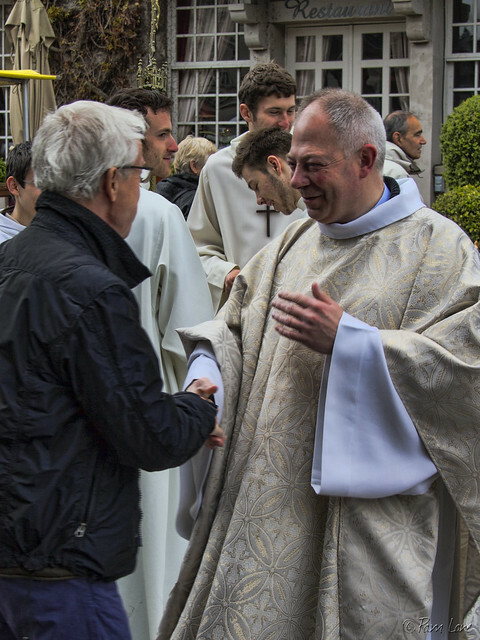 As the priest greeted his parishioners, it felt like Sunday-after-church anywhere. Visiting the Normandy American Cemetery was a sobering experience. Approaching the cemetery, all you see is row upon row of white marble crosses. 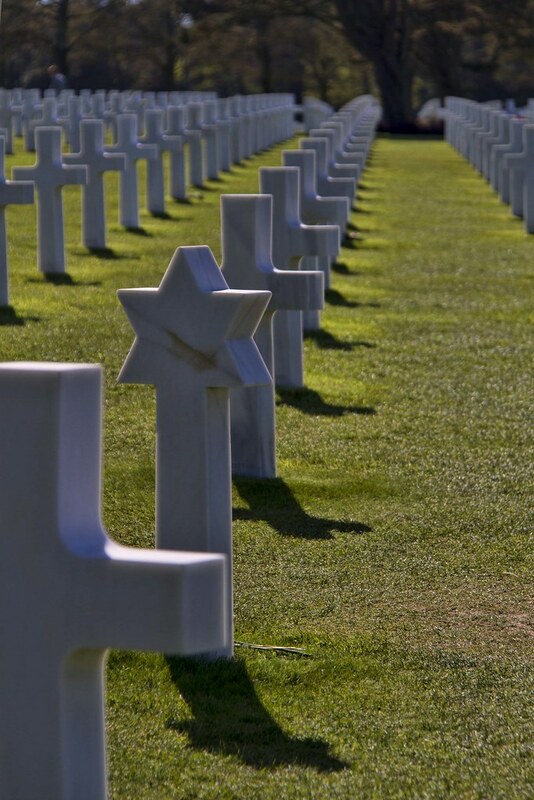 The American Cemetery is the final resting place for 9,387 of our military dead. 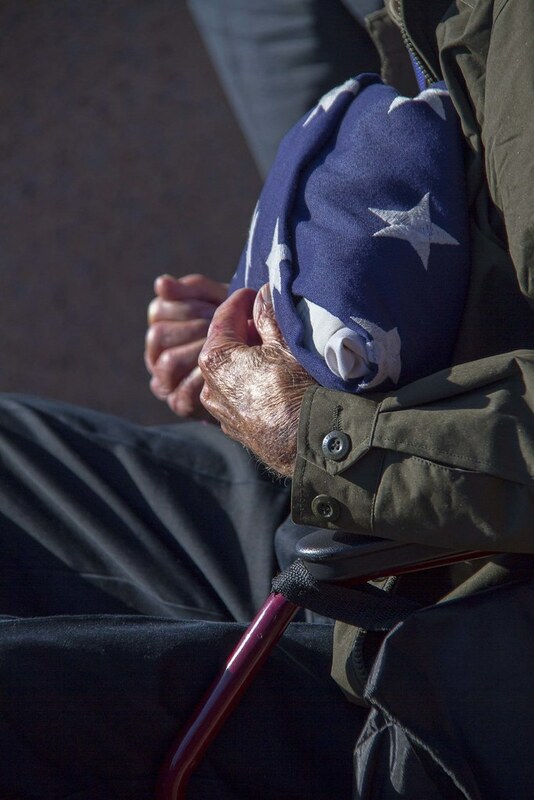 Walking through the never-ending crosses, I noticed a ceremony at the flagpoles. 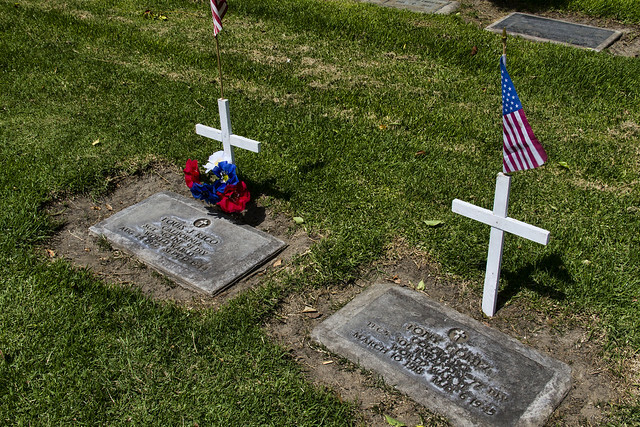 I recognized the same baseball caps I had seen in Memorial Day celebrations on the heads of the old soldiers in Downey. The caps identify them as soldiers and where they fought and served. 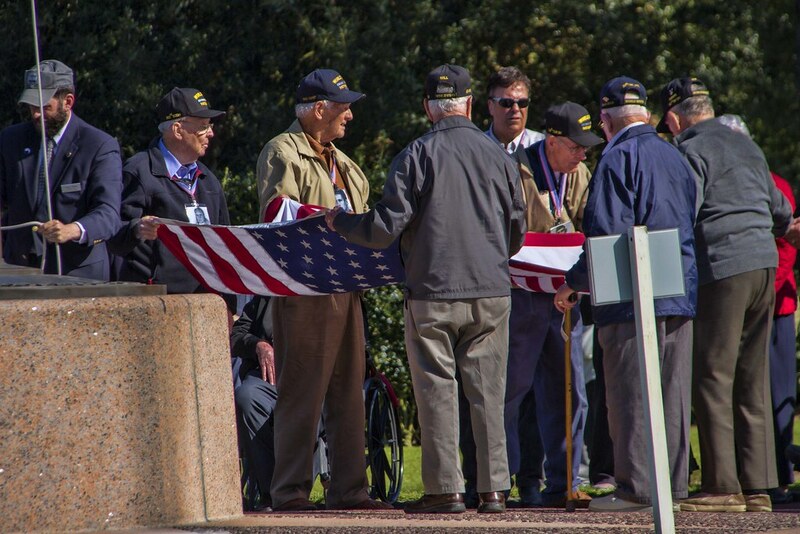 This was a gathering of some of the D-Day soldiers who had survived and came back to honor their fallen comrades. 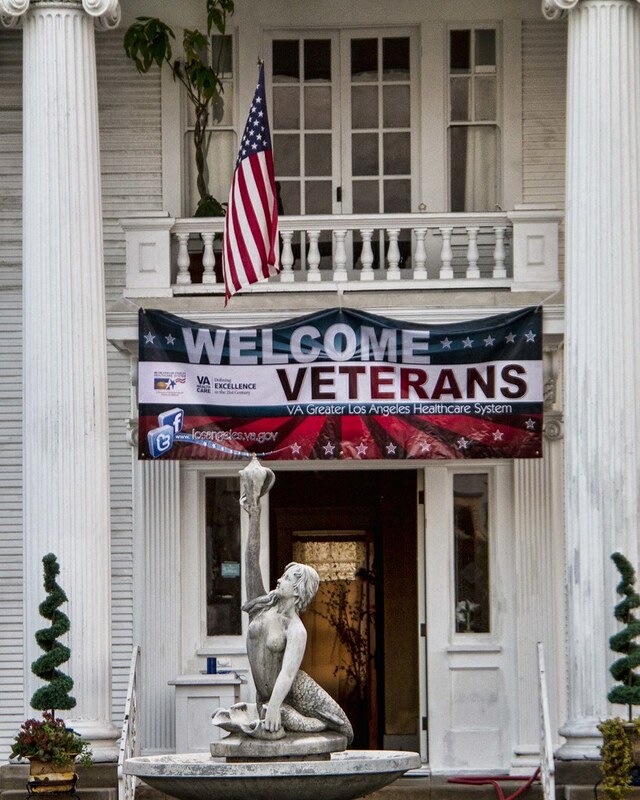 "Our debt to the heroic men and valiant women in the service of our country can never be repaid. 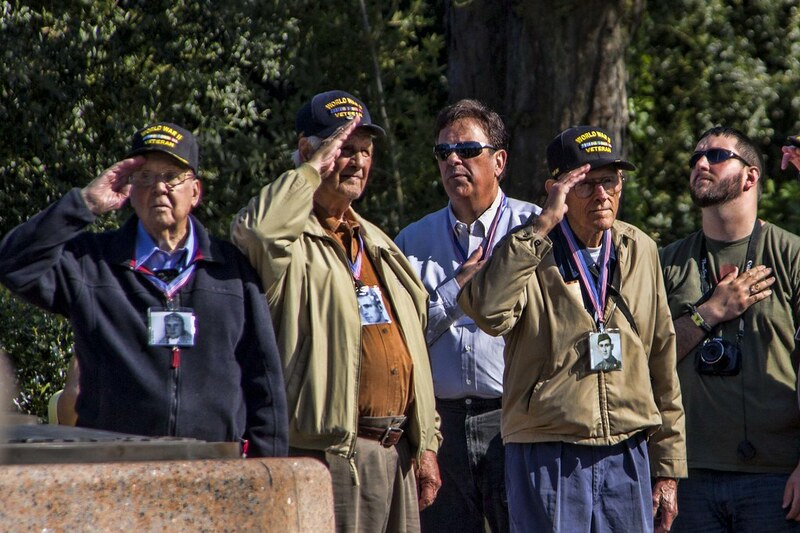 They have earned our undying gratitude. America will never forget their sacrifice."